Chaeto (Chaetomorpa spp.) 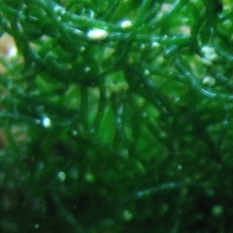 is a green macroalgae for usually used in refugiums, and is widely regarded for its filtering capabilities. It is extremely hardy, and can be kept by the novice aquarist. Simply put it anywhere in your system, give it light strong enough to grow nuisance algae and it should be easy to keep. Chaeto grows very quickly under the right conditions once established in the tank for some time. For best growing results give it bright lighting and moderate flow. We ship a tennis ball size of Chaeto with each purchase.This should be enough to start a refugium. The point of keeping chaeto is to get it to grow so you can harvest portions of it; removing "bound" nutrients. It serves little purpose to start off with a large amount of chaeto so you should probably only get 1-2 of this product at most. This chaeto is seeded with copepods, which if protected from predation will begin to populate your refugium and eventually your aquarium. We normally carry Chaetomorpha crassa, but also have Chaetomorpha linum available periodically.